Ten foam inserts will keep your brush working like new wheel after wheel! 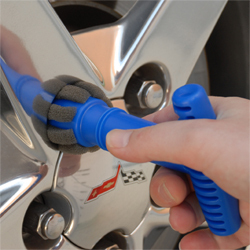 The Recessed Wheel Lug Nut Cleaning & Polishing Brush is the ultimate time-saving tool for cleaning recessed lug nuts. Keep the brush performing like new by replacing the Foam Inserts as needed. 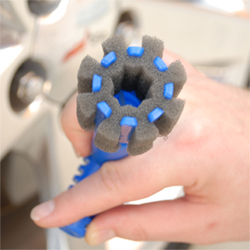 The Recessed Wheel Lug Nut Brush Kit includes the brush handle plus TEN foam inserts. Maintaining clean wheel has never been so simple! The Recessed Wheel Lug Nut Cleaning & Polishing Brush has a round foam cleaning head that surrounds the lug nut to clean it entirely with one quick motion. In literally seconds, you can completely clean all the lug nuts on one wheel. The Recessed Wheel Lug Nut Cleaning & Polishing Brush has a T handle for easy operation. Give it a twist or two to completely clean the lug nut itself and the wheel cavity. The Recessed Wheel Lug Nut Cleaning & Polishing Brush cleans wheel cavities from 1 3/8 to 2 inches with lug nuts from 3/4 to 13/16 inches - the perfect size for Corvette wheels. The secret behind the success of the Recessed Wheel Lug Nut Brush is the unique shape of the foam inserts. When placed on the brush, the foam surrounds the lug nut, cleaning both the lug nut itself and the opening on the wheel. The soft foam holds plenty of soapy water or wheel cleaner to make the job even easier. Replace the foam insert as needed to easily remove brake dust and grime from the lug nut cavity. To get even more mileage out of your foam inserts, wash them from time to time in McKee's 37 Polishing Pad Rejuvenator. Wheel cleaning is a tough job, so when the foam wears out, replace it with a fresh foam insert to keep your Recessed Wheel Lug Nut Brush working at peak performance. The Recessed Wheel Lug Nut Brush Kit is the secret behind spotless wheels, right down to the lug nuts. A total retail value of $21.97. Save $5.98! Works great on my truck wheels. The lug nuts and the area of the wheel around them were extra dirty due to the winter, this cleaned them right up. A nice product, better than a bristle type brush. Won't work on narrow lug nut access though. THIS IS THAT HANDY LITTLE ITEM YOU DIDN'T EVEN KNOW YOU NEEDED! After slopping suds into the voids around the exposed lug nuts of many of my cars through the years, I just resolved myself to the fact that they would remain uncleaned. Just found this little item while "thumbing through" Autogeek and thought I'd give it a try. I always clean my wheels first before the body of my car and using this tool adds probably thirty seconds per wheel to a wheel clean. They work great! ProsNever saw a product like this before. I have recently renewed my obsession with keeping my cars clean. I was pleased to see a product like this to clean down in the gap around the lug nut. Make sure, before ordering this product, that the diameter of your lug nut holes will conform to the diameter of the cleaning sponges: useless, too large, on my 2003 Mach 1; ok on my 2015 Hyundai Sonata. In addition, it's a little pricey compared to the actual contents: a plastic T-handle; a handful of sponges.